Superb traditional cuisines, authentic flavors are some of the imperative aspects one can easily associate with Suruchi restaurants at Ghaziabad. 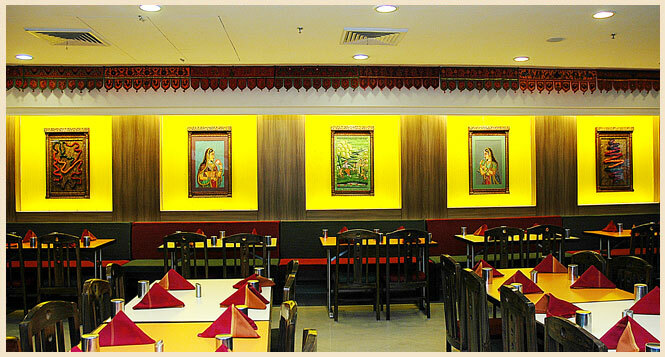 The restaurant has a specialty in serving a multi ethnic cuisines from all over India. Its menu includes a variety of aromatic dishes not generally found in most Indian restaurants. The cuisines include delicacies from Punajab, Gujurat, Rajasthani and Southern Indian dishes. The restaurant offers a fine dining ambience with its rich and detailed interiors which are perfectly complemented by a great choice of traditional Indian cuisines. Rejuvenate yourself with holistic service offered by the restaurant. The spacious and comfortable seating arrangements by the restaurant will help you to relax and recharge yourself while you enjoy your meal. The exceptional high standard of services set by the Suruchi, is what distinguishing it from other vegetarian restaurants in Ghaziabad. Our highly trained team of chefs offers the best and authentic Indian cuisines. It has made a mark in serving finest gourmet dining experience for their customers. The cuisines served at the restaurant features a selection of some of the most famous dishes from the country. These dishes are prepared using fresh vegetables procure directly from certified vendors. The fresh vegetables and spices are used in preparing the dishes that helps in taking out the delicious and amazing taste that has become synonymous with Suruchi restaurants. The food there is served hot, beautifully garnished and one can place orders from the menu that is filled with delicious cuisines from Northern and Southern India. The delectable Punjabi food, famous worldwide for their delicacies such as Parathas, dal makhani and traditional dish of makki-di-roti and sarso ka saag will delight your taste buds. Apart the Rajasthani and Gujarati's world famous dishes are a treat to feast. If you are fond of snacks and love to eat them at any time of the day, the restaurant serves some of the delicious and tempting snacks like Pav bhaji, Pani Puri, Dahi bhale, Aloo Tiki etc. People have special liking towards them because of their unique and tangy taste. The restaurant serves crispy, delicious and spicy snacks that will surely satisfy your hunger. At Suruchi, options are huge and one can get snacks that are popular in the country under one roof. With its royal surroundings, graceful and sophisticated ambiance, Suruchi restaurants, offers a culinary experience which is as intriguing and delicious as India's rich cultures and traditions.